I don't know if anyone noticed but last week I wasn't at English Pocket. Where do you think I was? Can you guess? That's right! I was in New Zealand! I went to New Zealand for my sister's wedding. She got married in a little church in front of her friends and family. My daughter, Ayane, was a flower girl. She walked down the aisle carrying flowers and stood in front of everyone with the bride. She was nervous and cried a little, but she was very cute. In Japan, the season is winter, but in New Zealand the season is summer! During the summer, New Zealand has Daylight Savings. People change their clocks so that the day lasts one hour longer. We can enjoy BBQs and trips to the beach until late at night. It is very fun. I took Ayane to the beach. 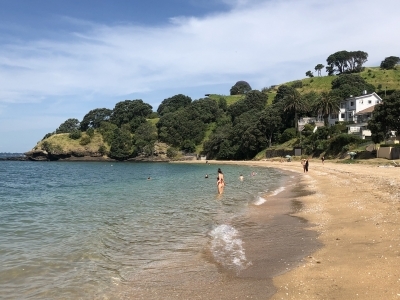 The name of the beach is Cheltenham Beach. I used to swim here every summer. Ayane had never swam in the sea before. Have you swam in the ocean before? At first, she was worried there would be sharks but once she got in the water she loved it. When it was time to go, she didn't want to come out! After the beach, we had ice cream. The ice cream shop makes the biggest ice creams in New Zealand. You can have a 12 scoop ice cream! I only had 2 scoops. Twelve scoops is too many! How many scoops do you think you could eat? New Zealand was very fun. I had a relaxing time. I hope you can visit someday and enjoy the nature. Japan is cold right now but I'm excited to be back. It's nice seeing everyone again.